Saperstein, Mare Herzig, Arno Battenberg, J. Friedrich Silber, Marcos Kreisel, Haim Wiese, Christian Hagemeister, Michael Zaretsky, Eli Michels, Evi Schroeder, Werner Wilke, Carsten L. Nadell, Pamela S. Morgenstern, Matthias Sapoznik, Henry Efron, John M. Norkina, Ekaterina Kosuch, Carolin Jaiser, Gonstanze Scheuerman, William E. Gruschka, Roland Studemund-Halévy, Michael Meyer, Michael A. Hofmann, Stefan Berger, Michael Olson, Jess Schüler-Springorum, Stefanie Meyer, Beate Gross, Raphael Freidin, Gregory Berg, Nicolas Leicht, Reimund Biemann, Asher D. Domdey, Horst Rohrwasser, Michael Haller, Michael Poznanski, Renée Zohar, Zvi Eisele, Theresa Rodrigue, Aron Breitman, Richard Sullam, Sirnon Levis von Rohden, Frauke Randhofer, Regina Pollack, Jonathan Z. D. Ben-Ari, Nitsa Díaz-Mas, Paloma Schwarz, Memme Makhalova, lrina Coppi, Hans Weber, Klaus Ristau, Daniel Khazan, Vladimir Soltes, Ori Z. Lamdan, Ruth Weidner, Daniel Bilski, Emily D. Naar, Devin Lévy, Clara Gillerman, Sharon Birnbaum, Pierre Werb, Bret Shire, Michael Ehn, Michael Strouhal, Ernst Gelber, Mark H. Lavi, Shai Goikhman, Izabella Dynner, Glenn Saß, Anne-Christin Necker, Gerold Ezrahi, Sidra DeKoven Koch, Gertrud Hambrock, Matthias Miron, Dan Engel, David Cohen, Raya McCormick, Rick Warnke, Nina Steffen, Katrin Loewy, Hanno Jaehner, Inge Reitter, Paul Johnston, Elizabeth Eva Ray, Jonathan Herrn, Rainer Sarna, Jonathan D. Morlok, Elke Aust, Cornelia Grimstad, Knut Andreas Thulin, Mirjam Gai-Ed, Efrat Schülting, Sabine Keane, Barry Green, Toby Gerber, Jan Barnai, Jacob Silberklang, David Isenschmid, Andreas Ticotsky, Giddon Goldberg, Chad Alan Müller, Marcel Feinberg, Anat Zimmermann, Moshe Quaasdorf, Friedrich Estraikh, Gennady Hartung, Gerald Balke, Ralf Jean, Yaron Kedar, Nir Schmid, Ulrich Hart, Mitchell B. Bachmann, Michael Mendes-Flohr, Paul Pickhan, Gertrud Kara, Cem Lohmann, Ingrid Ben-Naeh, Yaron Battegay, Caspar Knufinke, Ulrich and Keßler, Katrin 2014. Enzyklopädie jüdischer Geschichte und Kultur. p. 1. BAÑAGALE, RYAN RAUL 2009. “Each Man Kills the Thing He Loves”: Bernstein's Formative Relationship with Rhapsody in Blue. Journal of the Society for American Music, Vol. 3, Issue. 01, p. 47. RAPPORT, EVAN 2008. Bill Finegan's Gershwin Arrangements and the American Concept of Hybridity. Journal of the Society for American Music, Vol. 2, Issue. 04, p. 507. The Rhapsody in Blue (1924) established Gershwin's reputation as a serious composer and has since become one of the most popular of all American concert works. In this richly informative guide David Schiff considers the piece as musical work, historical event and cultural document. He traces the history of the Rhapsody's composition, performance and reception, placing it within the context of American popular song and jazz and the development of modernism. 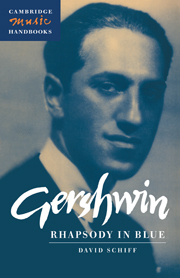 He also provides a full account of the different published and recorded versions of the work and explores the many stylistic sources of Gershwin's music. The book also contains an extended discussion of Paul Whitman's Experiment in Modern Music, considers the influence of the Rhapsody on other works (e.g. the music of Duke Ellington) and examines the traditions and institutions of Jewish cultural populism. ‘… a most convincing interpretation of this surprisingly complex work and provides a welcome and stimulating addition to the Cambridge handbook series’.